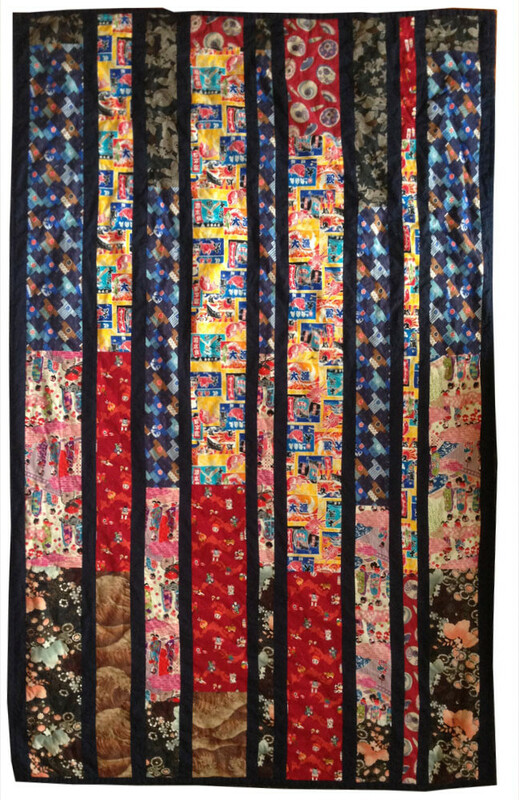 Megan Blanket Front Side – This piece was an exploration in color and texture. 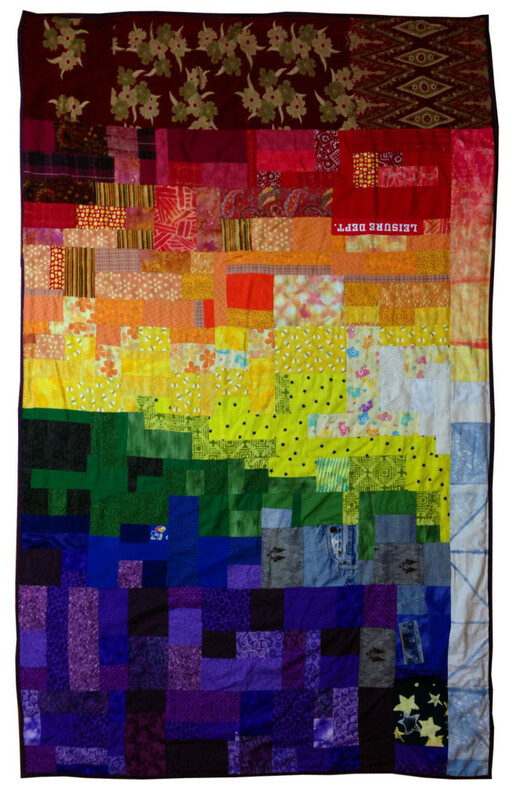 Various fabrics were organized by color to create a cascading rainbow color palette. 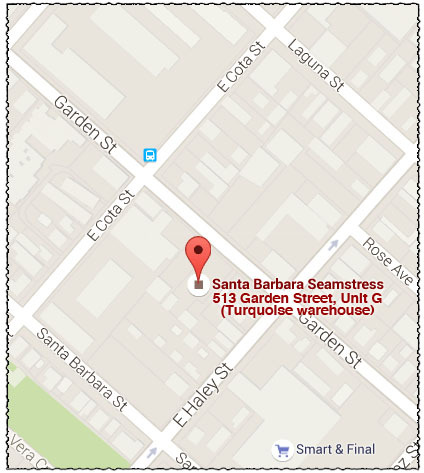 Although the patches vary in dimensions, it maintains a strict 90-degree grid structure. 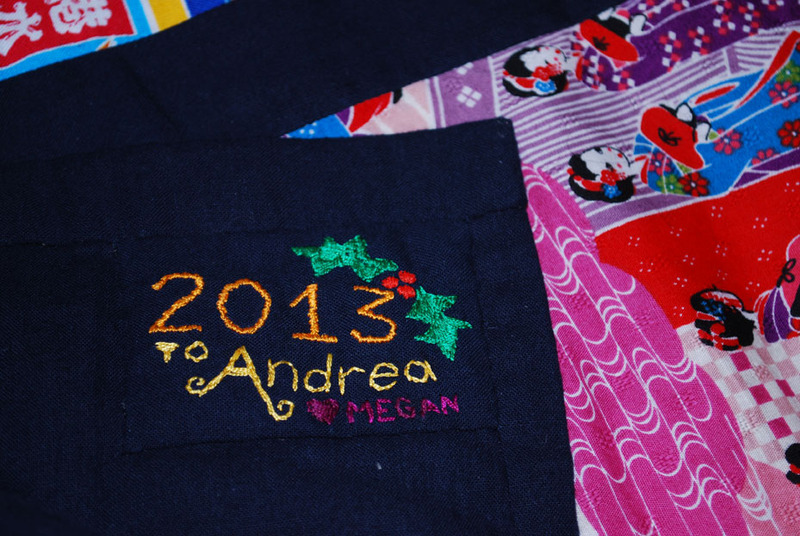 This side contains fabrics of various textures including corduroy, denim, sequins, and satin. 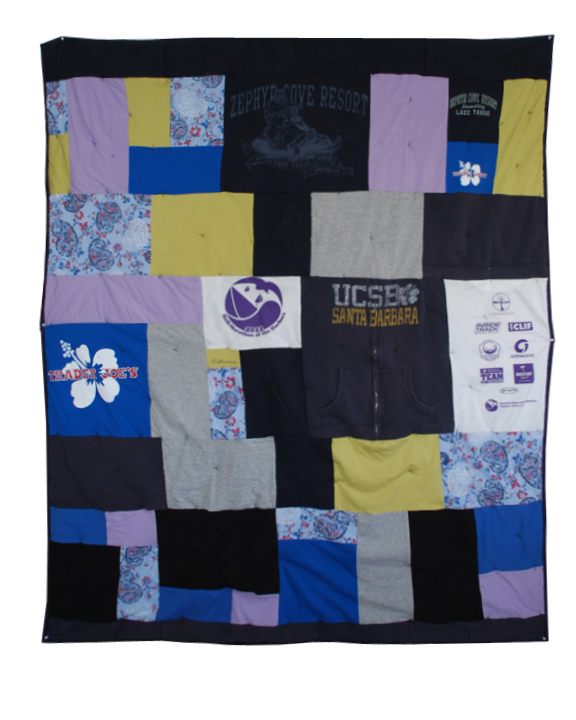 Megan Blanket Back Side – Dark Side of the Blanket. 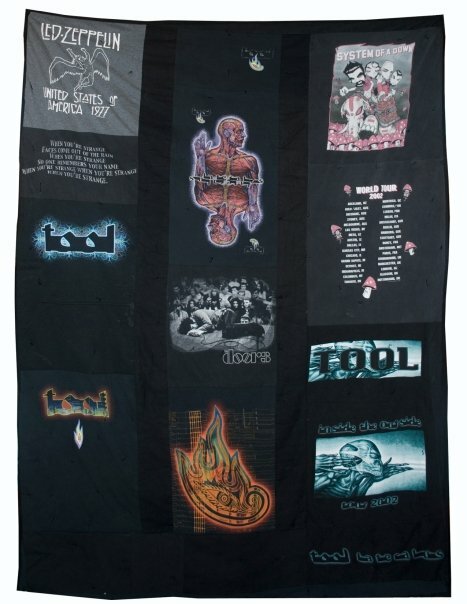 Various band t-shirts were preserved on the back side of the color study blanket. This side is very soft and cozy. 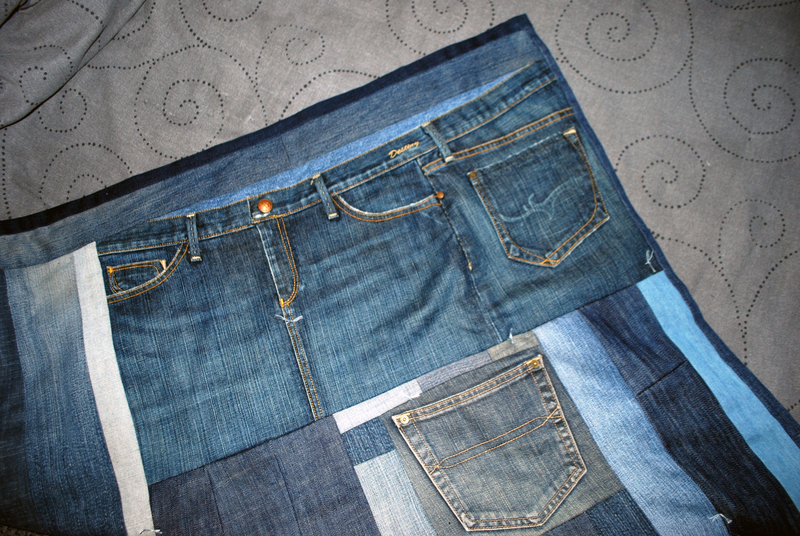 Denim Blanket – Old jeans were deconstructed and recombined to create this heavy, sturdy blanket. 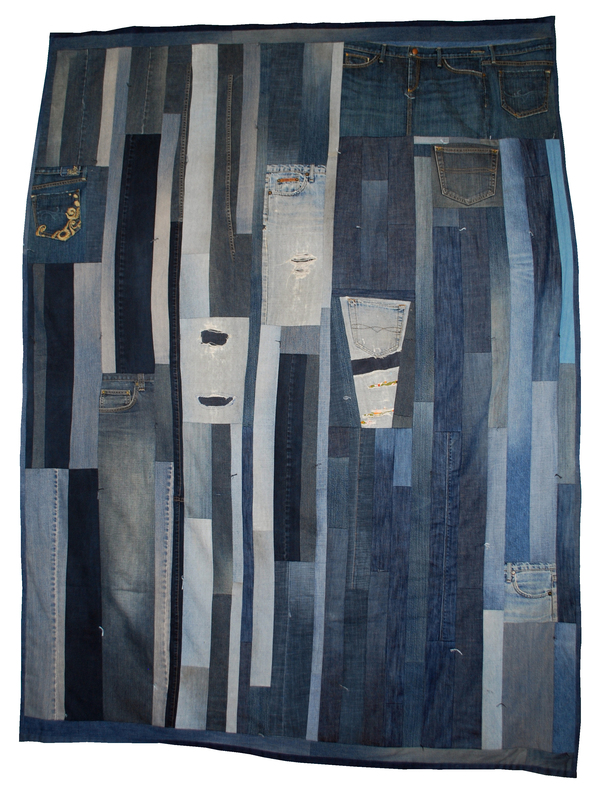 This piece consists of long strips of denim because it is following the natural deconstruction of existing jeans. Pockets and details of the original jeans were preserved in the blanket to reference the fact that this piece is a result of up-cycling used clothing. Pyrobar Quilt – Front Side – Blanket designed for the upper lounge of a fabulous art car. Primarily constructed of corduroy. Warm, soft, heavy-duty blanket for cold playa nights. 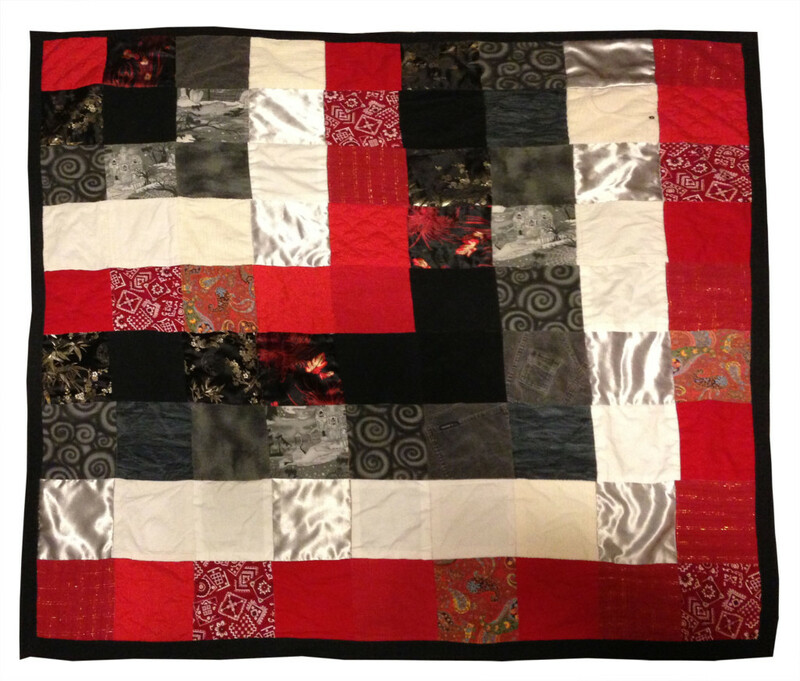 Pyrobar Quilt – Back Side – Blanket designed for the upper lounge of a fabulous art car. 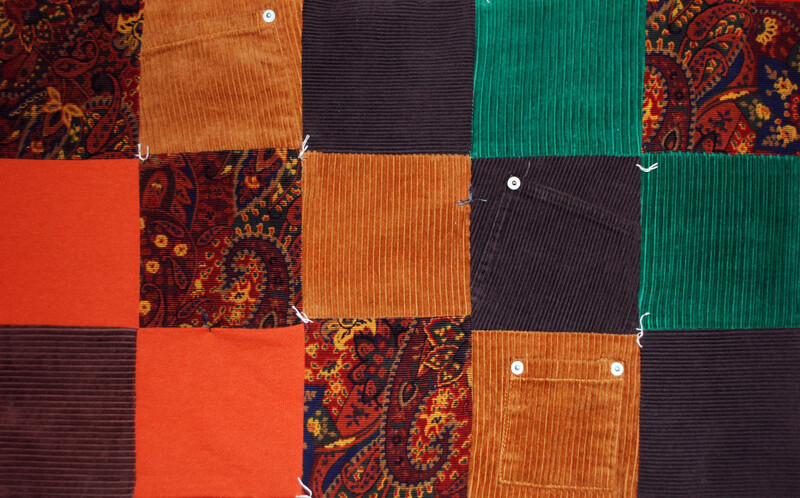 Detail of Pyrobar Quilt – Back Side – Blanket designed for the upper lounge of a fabulous art car. 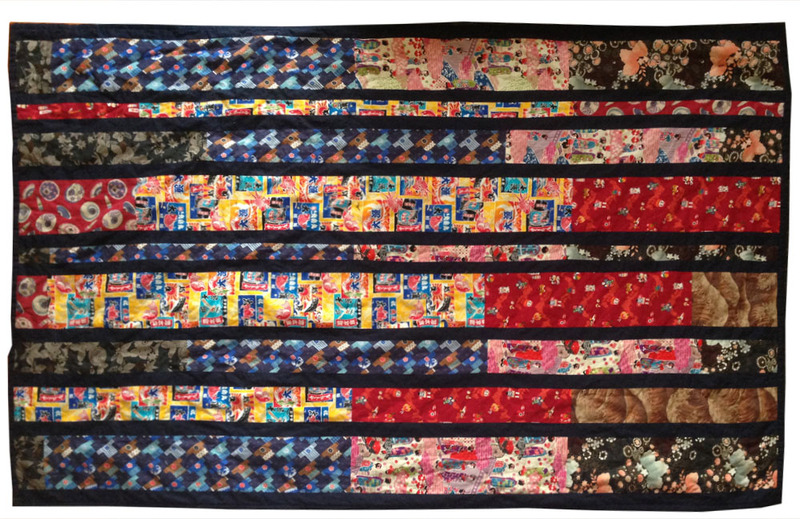 Pyrobar Quilt – Action Shot starring Siobhan McCleary! 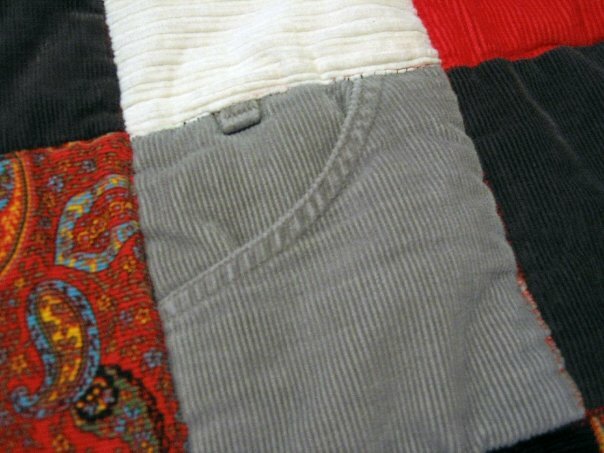 Red & Grayscale Quilt – This blanket was designed using deconstructed corduroy clothing. It is incredibly warm and a cat magnet. 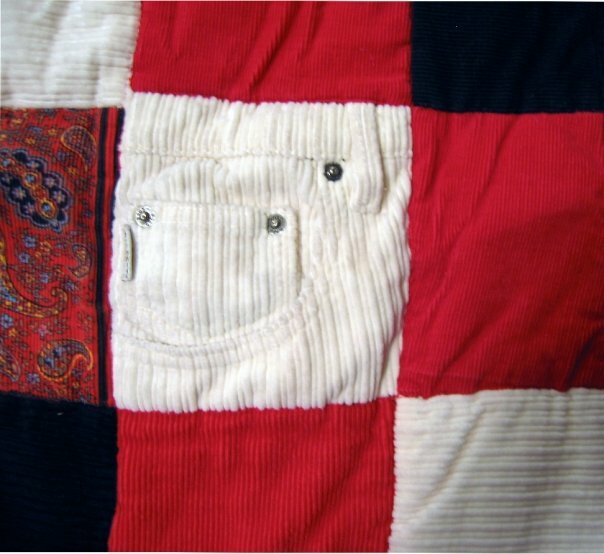 Some original pockets from the corduroy clothing were preserved in the quilt to add interest. 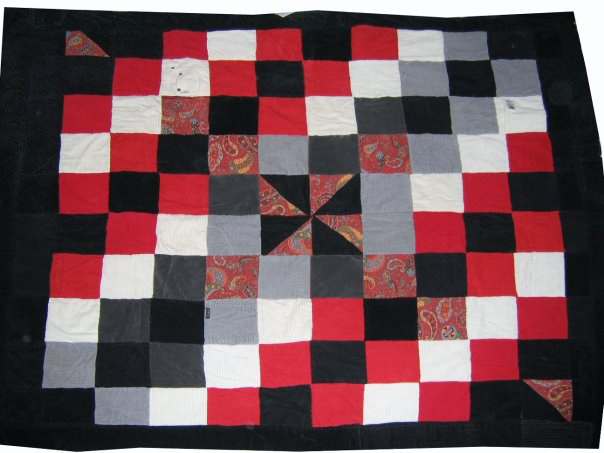 Red & Grayscale Quilt – Detail. Corduroy. 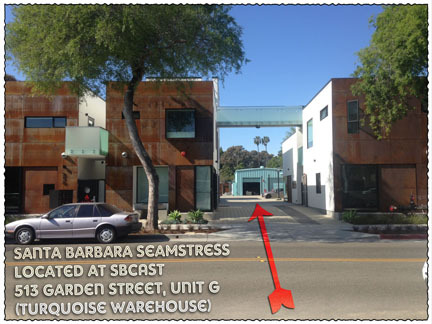 A few of these projects have low quality imagery. 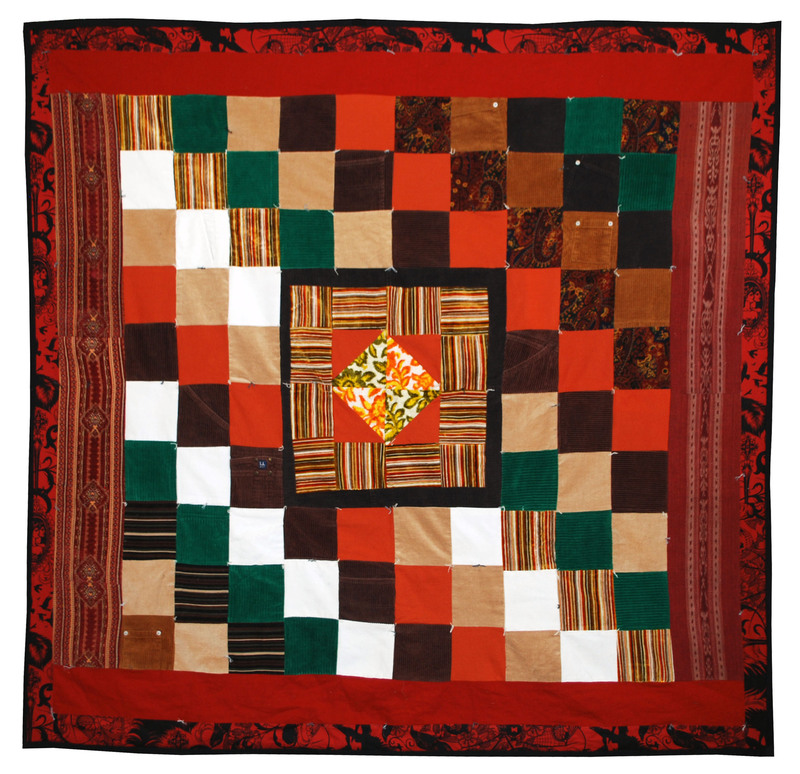 That’s because when I photographed some of my earlier work I didn’t yet realize that quilts were my destiny. 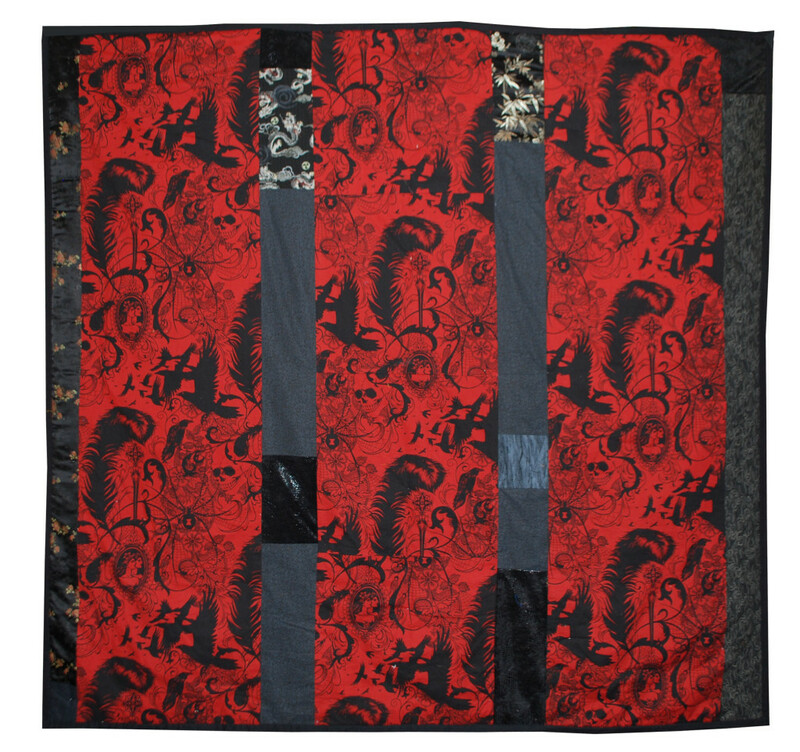 Red & Grayscale Quilt – Detail. Corduroy. 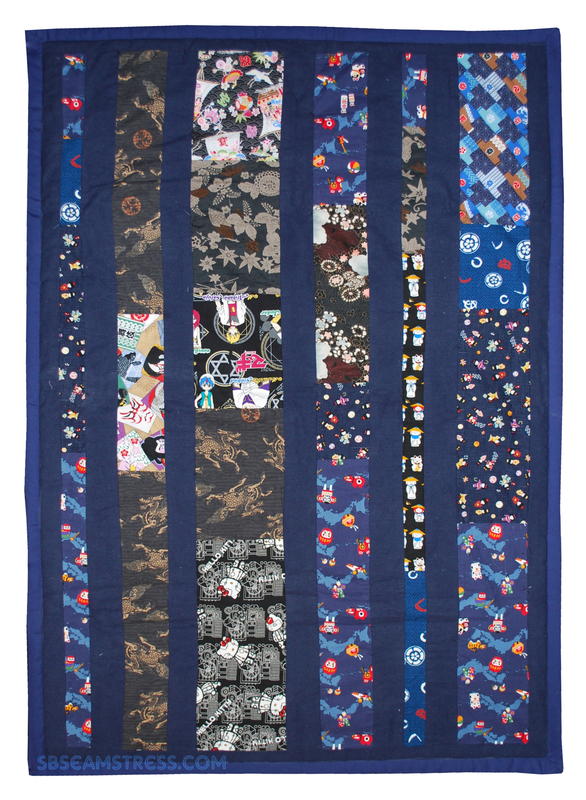 Baby blanket constructed out of Japanese fabrics. Front side. 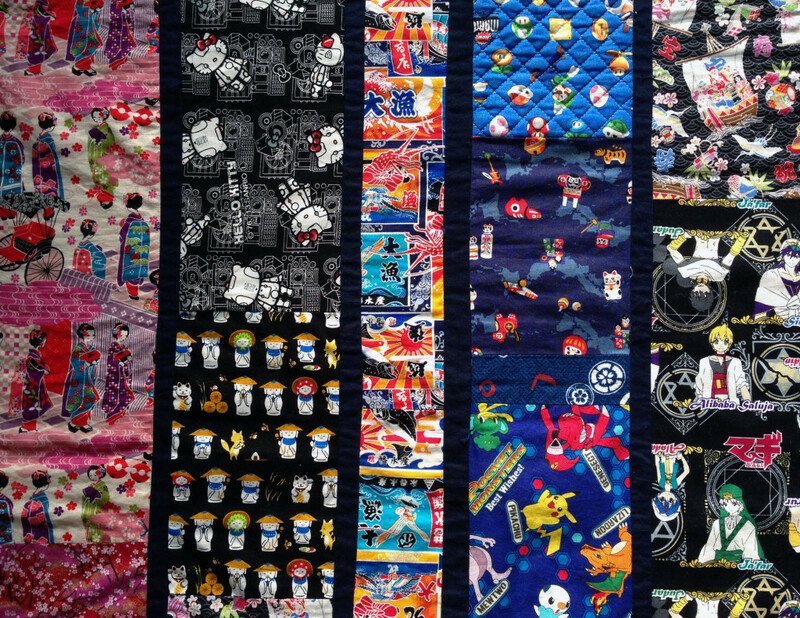 Baby Blanket constructed out of Japanese fabrics. Back side. 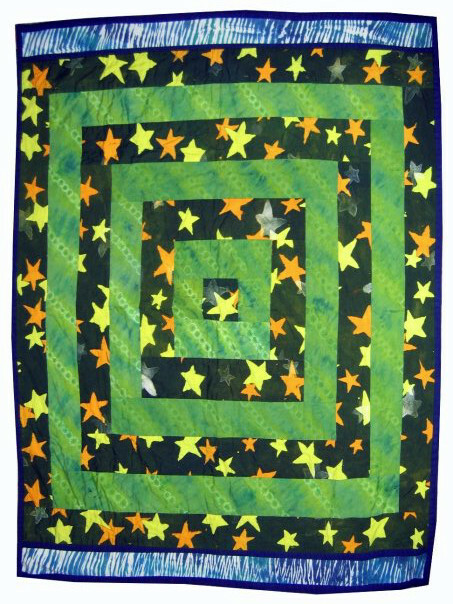 Star Blanket – I dyed all the fabric, then sewed it. 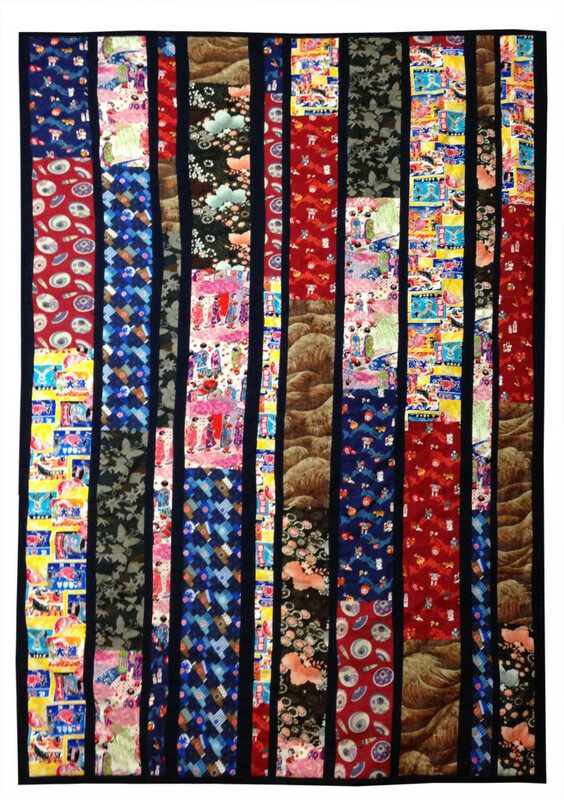 The zebra stripes on the edges were created through a process called arashi, where fabric is wrapped around a pole, bunched up, then tied with string. The dye was applied in a goey paste so it wouldn’t bleed through the fabric. The stars were applied with a sponge. 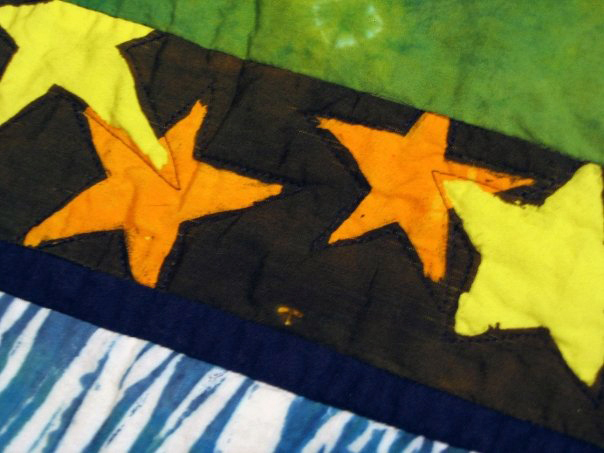 First I dyed it yellow and everywhere I wanted to stay yellow I painted a star shape with wax. Then I dyed it all orange and kept some fabric orange with more wax. I continued to add darker colors, keeping the color stars where I wanted with wax. 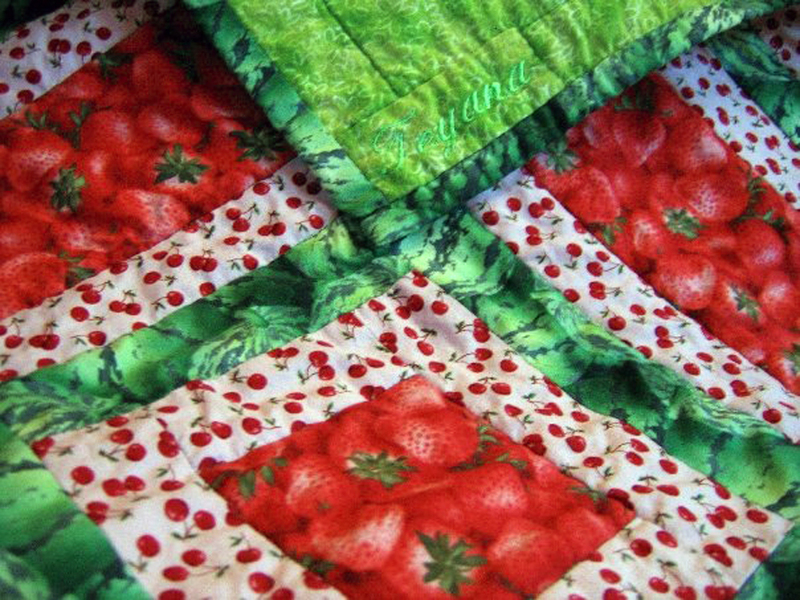 The green pattern was achieved by tying little loops around the fabric with dental floss. 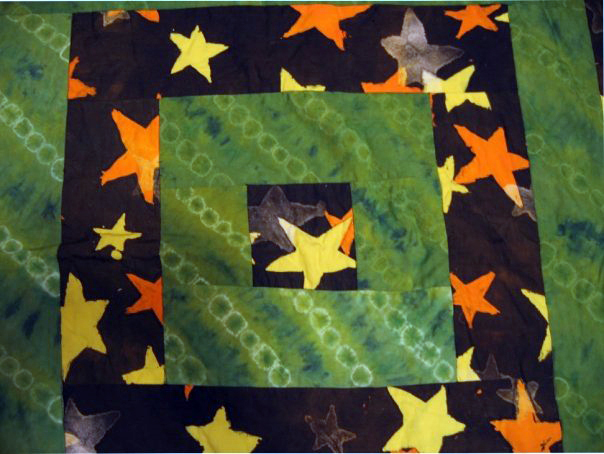 Star Blanket Detail – I dyed the fabric, sewed it, then traced around the stars with stitching. 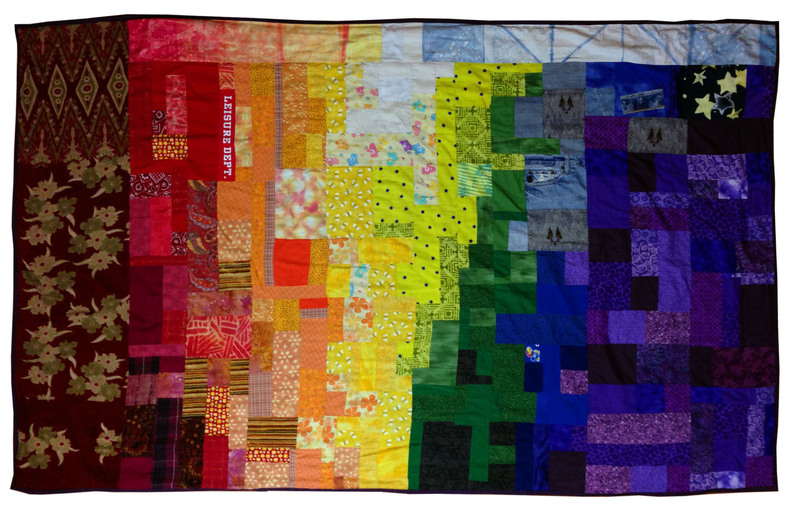 Rainbow Color Study Blanket – A variety of patterns and textures were combined, unified through color relationships. Each patch was created along a grid. 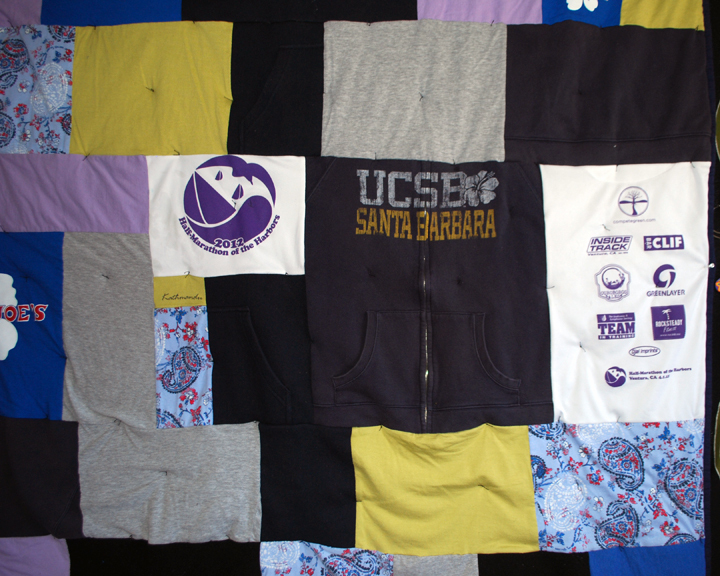 While the size and ratios of each patch may vary, the overall layout retains a strict 90-degree alignment. 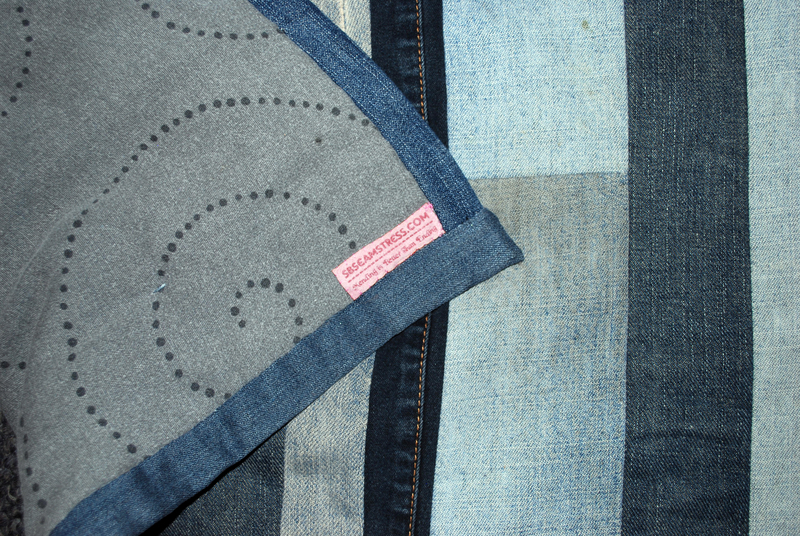 Material include cotton, corduroy, denim, satin, and flannel. 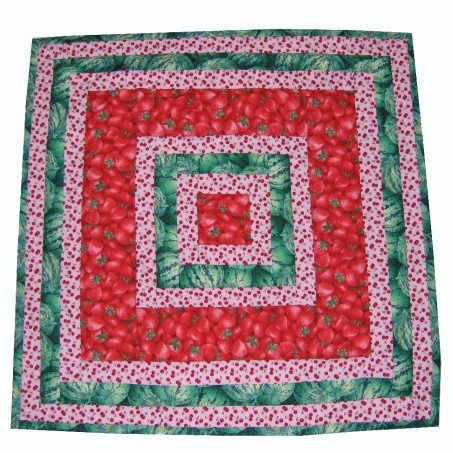 Strawberry Baby Blanket – This square design was created by beginning with a square and sewing uniform bands of fabric around it. 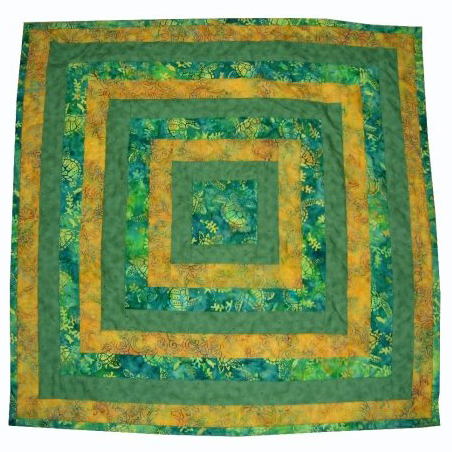 Cotton fabric. 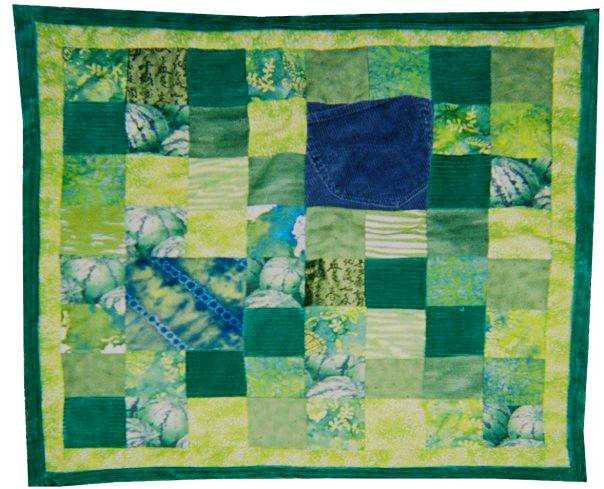 Green Baby Blanket – This was a fun exploration of how color can unite various textures. 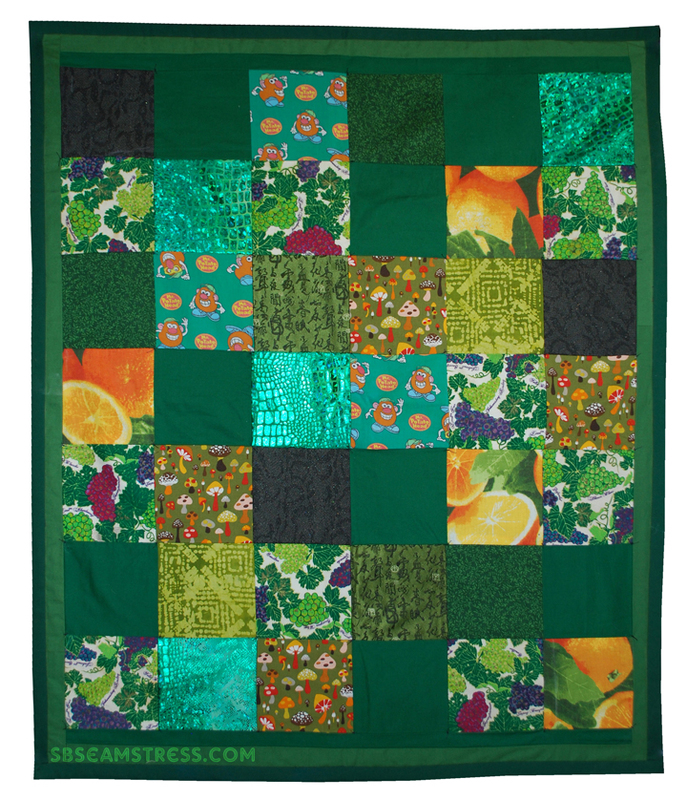 I also maintained a uniform square grid of patches but included 2 extra large squares that still fit within the grid. 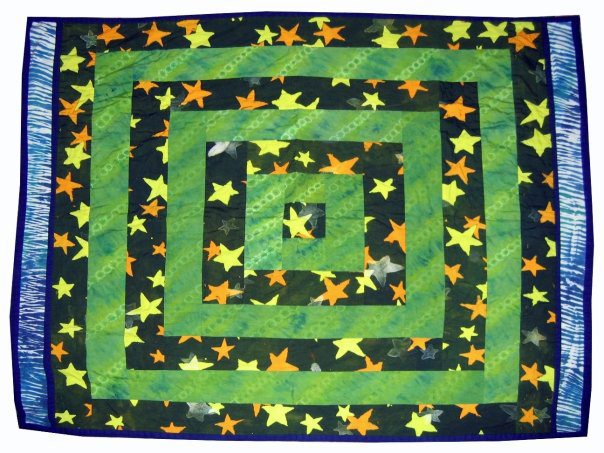 Turtle Baby Blanket – This square design was created by beginning with a square and sewing uniform bands of fabric around it. 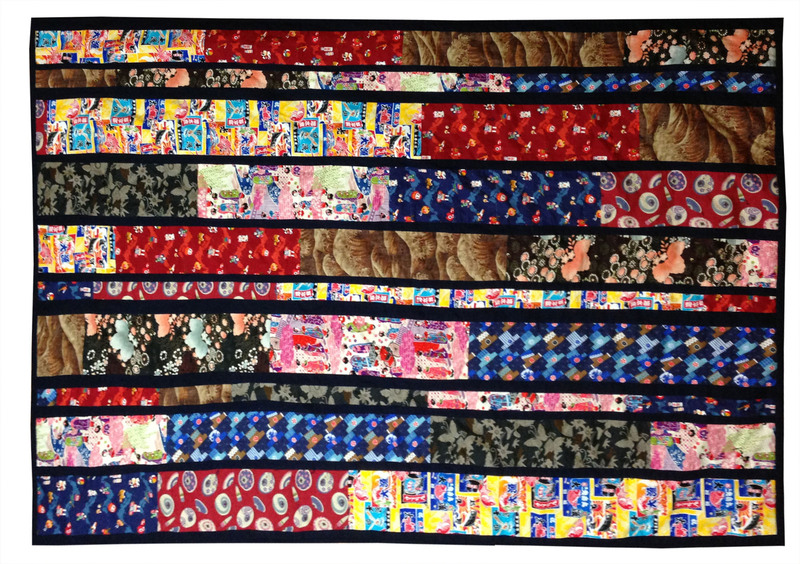 Cotton fabric. 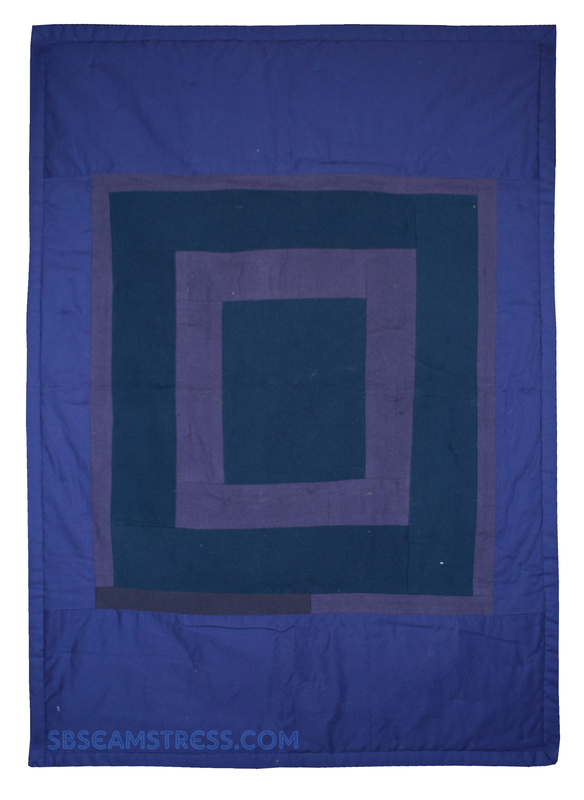 Lounge Blanket – This blanket experimented with a right-angled grid design. 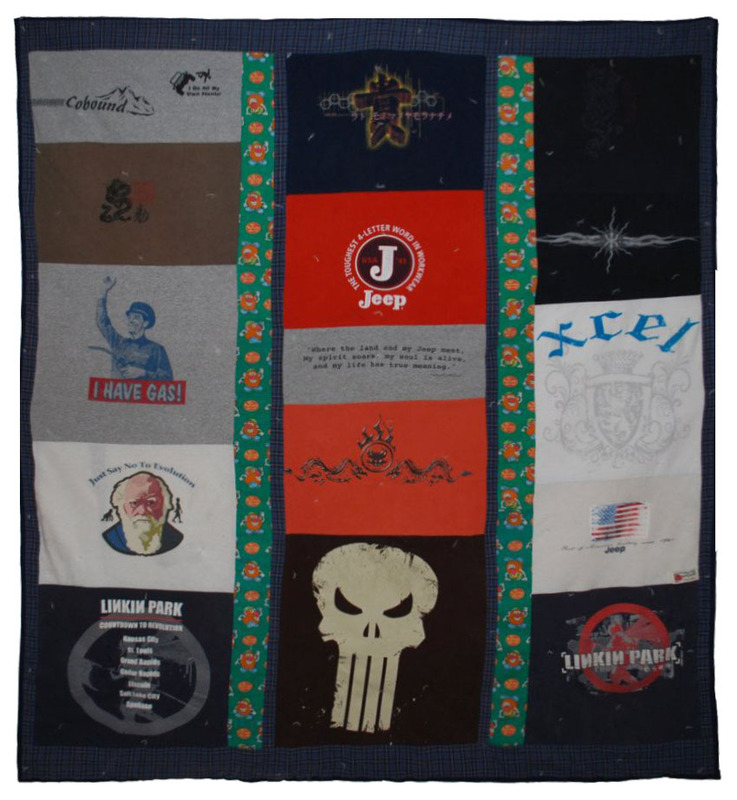 Chad’s Memorial Blanket – Designed from old t-shirts and pajama pants. 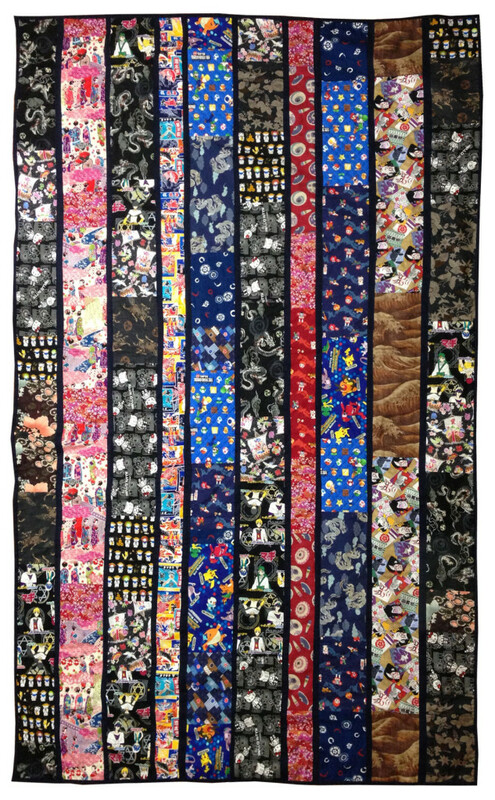 Japanese Blanket – While living and teaching English in Japan I collected various Japanese fabrics and designed a few blankets. I had good luck finding fabric in Shinjuku, Tokyo. 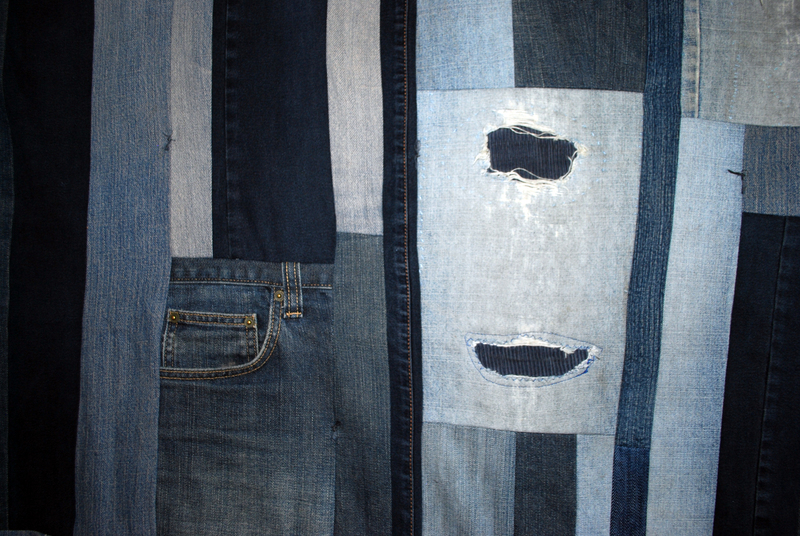 Inspired by the vertical writing system, I cut the fabric into long strips that flow up and down the design. 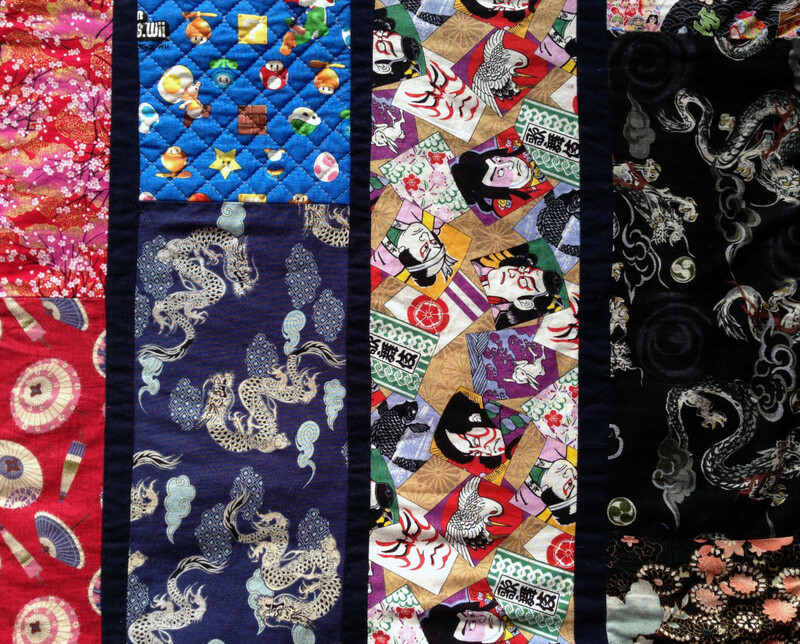 The prints reveal various sides of Japanese culture, from traditional florals to modern anime cartoons. First blanket in the series. 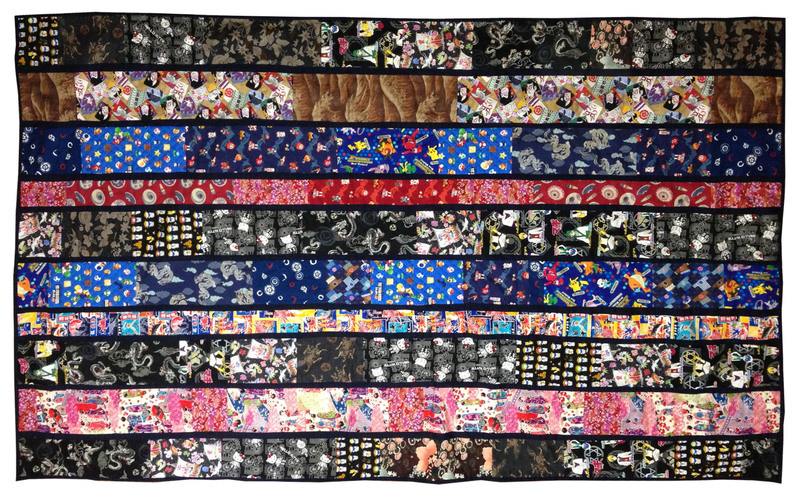 Tomodachi Blanket – Blanket made from Japanese fabrics. 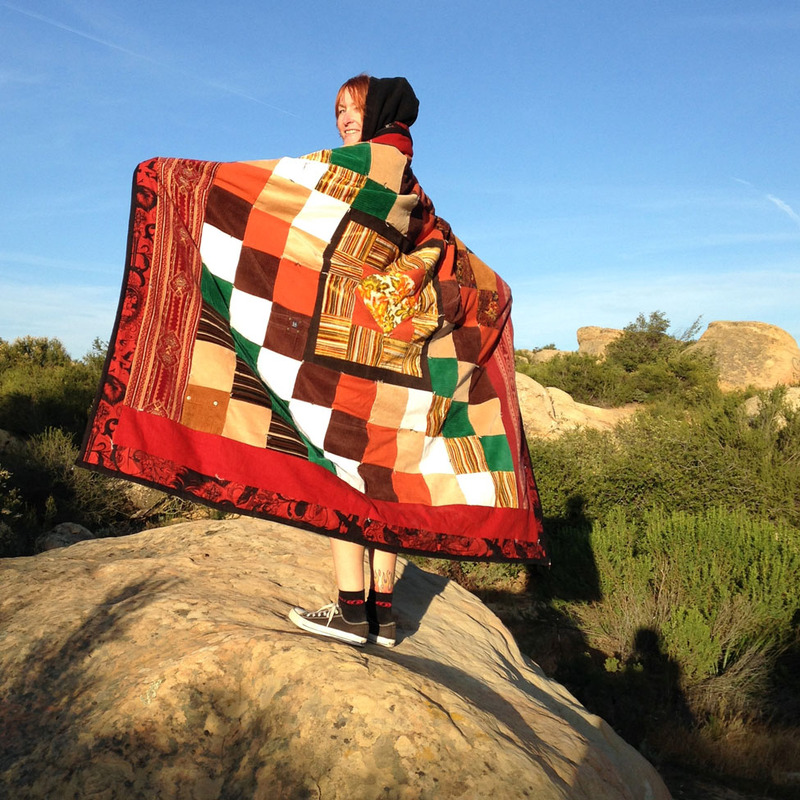 Second blanket in the series. Sensei Blanket – Blanket made from Japanese fabrics. 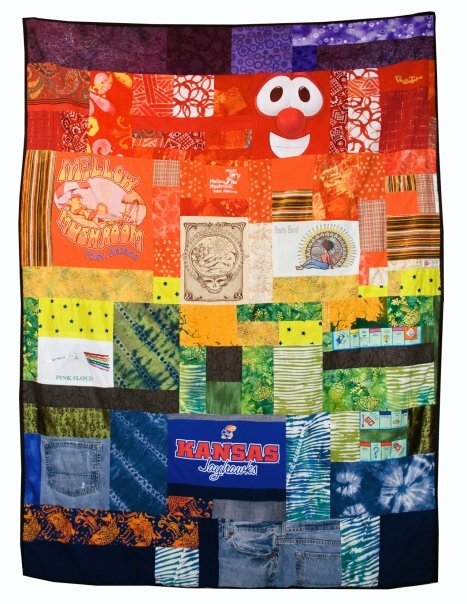 Third blanket in the series.